Twenty four year old Lunga Sam has experienced a dramatic turn around in his life. Encountered begging at The Fountain traffic lights in Rondebosch some 18 months ago by the GSCID social outreach staff, he is now employed by the GSCID as a Security Officer. The formerly homeless Lunga sleeping on the Liesbeek River Trail was discovered by Ingrid Frieslaar, the GSCID Social Outreach Manager, whilst on a regular street survey of homeless people within the GSCID precinct. She invited Lunga to visit the GSCID offices for counselling and assistance with obtaining his identity documents which had been stolen from him. Lunga visited the GSICD offices regularly, “sometimes as often as three times per week,” says Ingrid. In talks with him, she discovered that Lunga had in fact obtained his Security qualifications but had not yet had the opportunity of working in the field as a jealous family member had burnt the certificates. 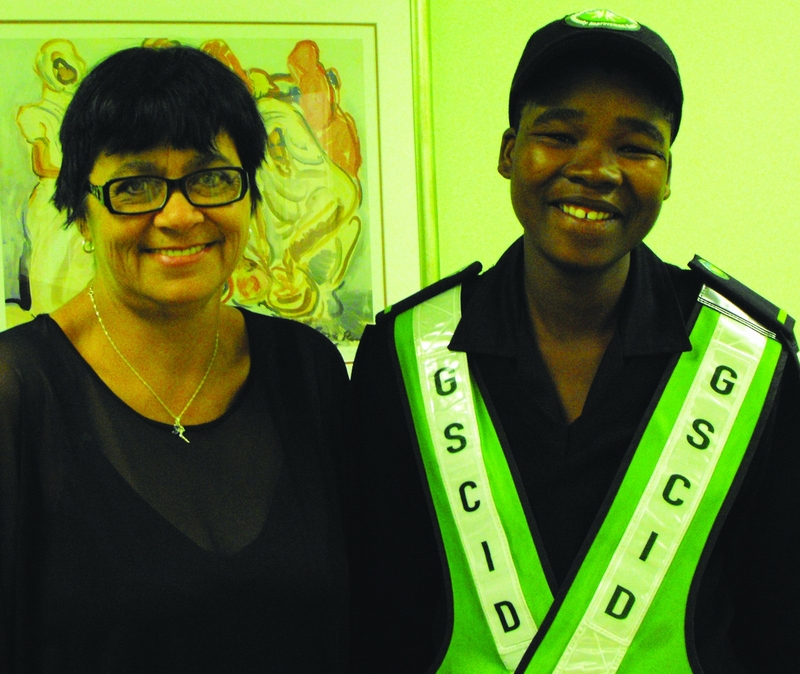 As part of the rehabilitation process, Ingrid assisted Lunga in obtaining copies of the security certificates and set up an interview with the personnel department of Securitas, the GSCID’s security provider. Having obtained SAPS clearance, passed a Training Centre test and attended a week’s security training, Lunga is now employed and on probation as a trainee security officer for the GSCID, until he obtains his Grade C Security certificate. He has 3 months in which to complete and pass the required examinations. Comments Charl Brooks, the GSCID’s Operations Manager: “Lunga has demonstrated a very disciplined approach to his work and so far is proving to be an outstanding patrolman. He has been ‘adopted’ and is being mentored by some of the more senior GSCID Security officers who are very protective over their ‘younger brother’. Says Lunga Sam: “I am so grateful for the opportunity to work and the time and effort the GSCID has spent on me, giving support and encouragement and assisting me with obtaining the various documents that I need in order to work.” His goals are to obtain his Grade C security certificate and to get his learner driver’s licence. Currently residing in a room in Langa, he aims to improve his present circumstances by finding a better place to stay. “I am very excited to be a part of the GSCID team,” adds Lunga. “Lunga is very enthusiastic and realising that this is an excellent opportunity for him, he is grabbing every chance he can get to work overtime. We have opened a bank account for him and are assisting him with the purchase of the basic necessities for setting up home,” adds Brooks.